As you have likely heard before, every penny counts. Today we are looking at a chart that shows the growth of a hypothetical investor who, in December 1999, had $500,000 in a beautifully diversified portfolio of stocks and bonds. 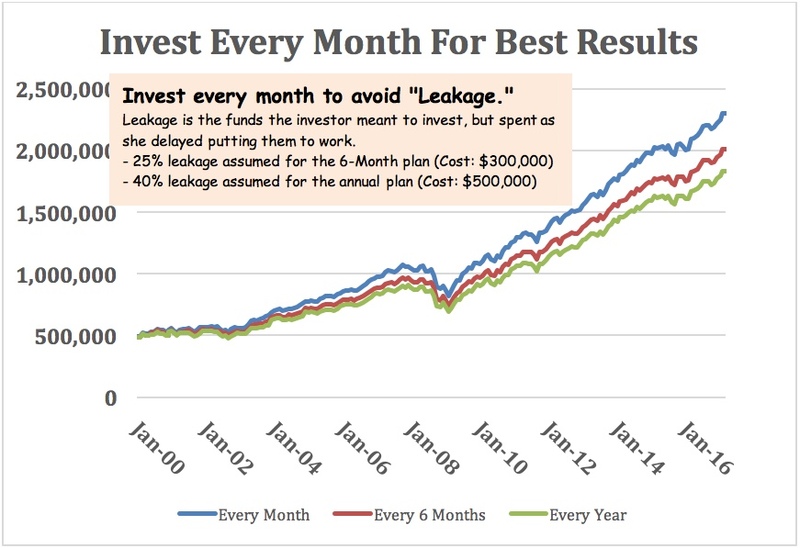 Further, this investor’s spending plan consistently created $3,000 of extra cash each month. Truly a nice place to be, heading into the “lost decade” of the 2000s. The three portfolio paths shown in the chart nearby estimate the growth of her portfolio over time under three different assumptions. The highest path assumes the investor diligently – no, religiously – placed her extra funds into the portfolio each and every month. The second and third paths assume there was a delay in investing, first for six months, the second for a full year. Now, we know what happens to idle cash, don’t we? We are tempted to spend on things we don’t truly and intentionally wish to purchase. For me, that would include extra cases of wine, perhaps an unplanned trip to Jamaica, or something else that is absolutely fun and equally absolutely unnecessary – but most importantly, unplanned. In the end, we can see how brutal this lack of consistent, automatic investing can be. If our “rich” investor had stuck to a monthly investment schedule, her nest egg would have grown to $2.3 million. However, a 6-month investment program would have netted $300,000 less and a 1-year program would have cost her a cool half million! The differences are most important – not the actual numbers themselves – because we don’t know if her plan would still be successful under the 1-year investment program. If so, then that extra spending should have been included in the original spending plan. Ahhh, but if we had included it and also chosen to delay investment, experience the leakage (Two! Yes, two unplanned vacations each year! ), would the plan survive then? Every penny counts. Especially those you don’t plan on spending.